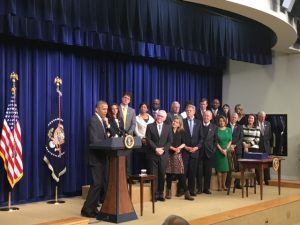 ANA was proud to be in attendance as #CuresAct was signed into law (represented by Michelle Artz, Director of Government Affairs). 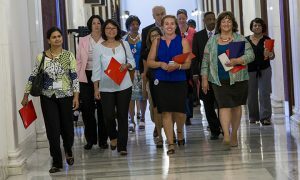 Throughout the year ANA advocated for key elements of the legislation including opioid epidemic funding, comprehensive mental health reform, and investments toward curing cancer. 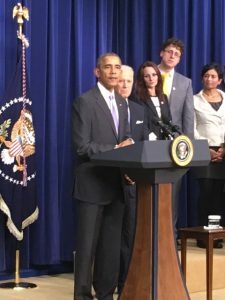 For nearly a year, President Obama has been calling for real resources to address the opioid crisis and ensure that hundreds of thousands of Americans can get the treatment they need. The bipartisan passage of the bill exemplifies the progress we can make when both parties work together to improve the lives of people across the country. “The Cures Act makes important investments that will save lives. First, for the families and communities that have lost too many loved ones to the heroin and prescription opioid epidemic, it invests the $1 billion I requested in my budget to address this crisis. Second, the bill answers the Vice President’s call for a Moonshot in cancer research by investing $1.8 billion in new resources to accelerate discoveries. Third, it invests nearly $3 billion to build upon the major biomedical research initiatives we have launched in my Administration – known as the BRAIN and Precision Medicine Initiatives – which are tackling diseases like Alzheimer’s and creating new research models to find cures and better target treatments. Fourth, the Cures Act takes important steps to improve mental health, including building on the work of my Administration’s Mental Health and Substance Use Disorder Parity Task Force. And fifth, the legislation advances the progress we’ve made in improving the Food and Drug Administration’s drug development process by, for example, making sure patients’ voices are part of those decisions. The urgent problems you face every day go beyond politics – they’re matters of life and death for your patients and crucial to the future of the nursing community. That’s why health care providers are going all in next week, stopping by Representatives’ hometown offices, making phones ring off the hook, and causing social media to erupt with the voices of nurses all across the country. Sign up for the national day of action now and we’ll make sure you have all the information you need to be ready on Monday! Come January, there will be big conversations about the future of healthcare on Capitol Hill. You’ve earned a seat at the table – and on Monday, you need to claim your place in the discussion. Click here to commit to making an impact on Monday! Whatever you can do, help make sure nurses are heard on December 12.